Can the Navy’s Electric Cannon Be Saved? This Thursday Feb. 23. 2012 photo provided by the US Navy shows A high-speed camera captures the first full-energy shots electromagnetic railgun prototype launcher that was recently installed at a test facility in Dahlgren, Va. The Pentagon’s futuristic railgun may be obsolete before it arrives. But not its high-tech bullets. The Navy’s futuristic electric cannon, or railgun, received yet more hype this week for its ability to fire a shell at up to 5,600 miles per hour, and do it far more cheaply than a missile. But there’s a daunting reality behind the hype: the Pentagon is already looking past the railgun to a less power-intensive, more easily deployable alternative. The railgun rounds can be fired from more conventional cannons, giving the same capability sooner and cheaper. Here’s how the railgun works: a sabot — a shell of tungsten inside a metal casing — is loaded into the gun. Instead of an explosive charge, the gun’s capacitors shoot an enormous amount of power, some 32 megajoules, into the shell and two long rails (instead of a barrel), creating an electromagnetic field that propels the shell down the rails at incredible speed. The Pentagon loved the idea as a cheap alternative to missiles for targets 100 miles away and getting dangerous gunpowder off of ships. Over the course of a decade, the U.S. has spent more than a half a billion dollars on the program. The gun is supposed to be deployed on the new Zumwalt class destroyers since the Zumwalt is basically the only ship that generates enough juice, 78 megawatts, to power the gun. 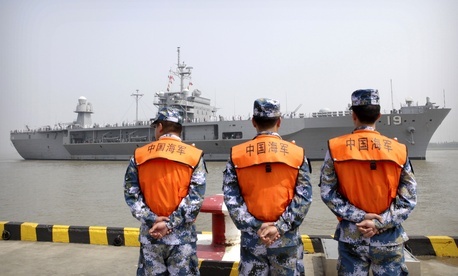 But the military is making just three of the ships. 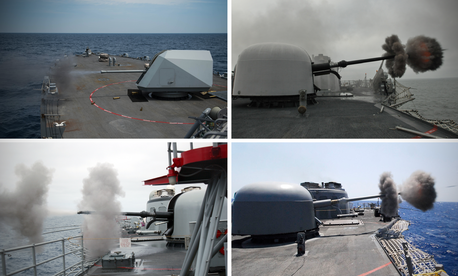 In 2012, the Pentagon realized that they could fire the railgun’s projectile out of the 5-inch powder guns on existing ships. No, it wouldn’t hit speeds of Mach 7 (topping out closer to Mach 3), but that’s twice as fast as a normal round fired from a 5-inch powder gun. Pentagon leaders who vaunted the program recently started talking it down. “We thought railguns were something we were really going to go after, but it turns out that powder guns firing the same hypervelocity projectiles gets you almost as much as you would get out of the electromagnetic rail gun, but it’s something we can do much faster,” Deputy Defense Secretary Robert Work told Congress in May. The Pentagon will now spend an additional $800 million, through the secretive Strategic Capabilities Office, on developing a defensive capability for the gun (meaning less power to shoot at shorter ranges) and also adapting the Navy’s other guns to shoot the railgun’s projectiles. “We are going to say … ‘Look, we believe this is the place where you want to put your money, but we’re going to have enough money in there for both the electromagnetic rail gun and the powder gun.’ So if the new administration says ‘No really the electromagnetic rail gun is the way I want to go,’ knock yourself out, we’ve set you up for success,” said Work. Vice Adm. William Hilarides, commander of Naval Sea Systems Command, said last year that, because of the railgun’s high power needs, it will be at least 30 years before the Navy considers removing powder guns from the fleet. Can the railgun be fixed? Future technology in the form of better parts, better capacitors, new materials, and more intricate design, will improve energy efficiency, and the utility of the gun, according to Colin Whelan, vice president of Advanced Technology for the Raytheon Integrated Defense Systems. Raytheon is one of the contractors working on the gun’s pulse power system and recently delivered one such system to the Navy’s railgun test range. Each one of these pulse power modules that delivers power to the railgun contains a conductor and a capacitor that are merged in a very small space (and cooled.) Reducing the amount of excess heat is key to preserving energy, since energy that doesn’t go into the actual firing process turns into heat. “We’ve come up with a whole host of solutions, from diamond heat spreaders, for example, to manifolds that have high density of embedded micro-fins to spread the heat very efficiently away from the small point heat sources and move them through things like graphite and aluminum graphite to the edges of cold rails, so that coolant can be circulated at that point and brought back to a chiller,” said Whelan. But managing heat isn’t the only key to squeezing more efficiency out of the gun. Better capacitors will also increase efficiency and this is where 3D printing and better computing-aided design could help. “We actually looked at utilizing some 3D manufacturing in packaging the inductor and capacitor into a very small size while also providing some of the insulating capabilities that you can get by printing dielectrics,” he said. A dielectric is a material that doesn’t conduct electricity but that will support an electrostatic field, which can store energy. Dielectrics are typical capacitor parts. “As dielectric films get better and better able to stand off higher electric fields, we can shrink the size of the capacitors and inductors further,” said Whelan. Then you can squeeze more capacitors into one space, resulting in less energy loss. Looking at the connection between the capacitors and inductors in more detail, making sure those connection points are perfect, are all also key to a better and lower-loss connection. “You aren’t simply bolting to connectors together. You have to understand down to the microscopic level what those interfaces look like. Likewise if you look at the dielectric film used in the capacitor, understanding how perfectly well formed that dielectric film is [is] a critical component of understanding how much energy density you can get and how much you can shrink it,” he said. 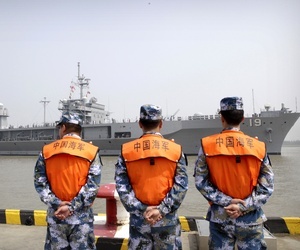 Engineering at the molecular scale, and future breakthroughs in dielectric materials, will enable more efficient railguns that could make their way onto a wider variety of naval platforms. That integration could happen faster than many today think possible, depending on the speed of research. But there are still problems with the railgun concept as conceived, according to University of North Carolina physicist Mark Gubrud, who says that for the gun to hit targets at vast distances, the Navy is going to have to put at least 32 megajoules into each round—and probably more. You can make that more efficient in terms of energy loss but that’s only part of the problem. The act of firing the gun with that much power destroys the gun’s rails very quickly, limiting it’s use. “The capacitors and switches could always just be scaled up. Additional power plants could be provided if needed to maintain the firing rate … The real limit is how much energy per shot you can deliver to the projectile + sabot without destroying the rails too fast,” he said. “All that plasma that you see when the gun erupts, that’s material from the rails and sabot being vaporized at the sliding contact, unlike a powder gun where the barrel isn’t much eroded and the flame is from the propellant gases. I think this is what limits the total energy that can be delivered to the projectile in practice,” he said. The reason you want to deliver more power into the shell is to give it more kick when it actually reaches its far-away target. “They are trading off mass vs. velocity/range, under a constraint on the total energy,” says Gubrud. “They want to be able to say it’s hypersonic, and has much greater range than powder guns … That’s the principal virtue of the railgun as compared with powder guns or any pyrotechnic gun.” Because the round is so light, 23 lbs versus 70 for a conventional 5 inch shell it loses most of that energy in flight, he says. In other words, no matter how much you improve the power source, the gun will still face limitations. There’s no breakthrough that lets you break the laws of physics. Gunfight! 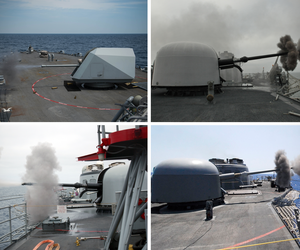 Does the Navy's Little Warship Need a Bigger Cannon?